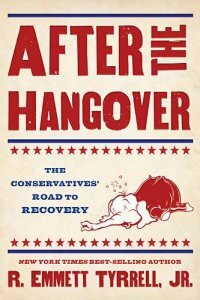 I don't read a lot of political books, but After the Hangover by R. Emmett Tyrrell looked interesting. I'm a conservative and, like many of my conservative friends, not too happy with the conservative political party at the present. I thought it would be interesting to read what Tyrrell had to say about it in his book and what can be done to make it better. Unfortunately, I haven't been able to get through the book. I've tried several times to read it, but I get bogged down with all the descriptions and random information. I finally skimmed through the book trying to zero in on his point. I couldn't find one. In all fairness, perhaps if I were more interested in politics in general, I might have gotten more out of the book. However, if he hoped to "preach" to someone other than the "choir," it didn't work. I would like to see a book that was easier to read and provided more ideas on how to fix the conservative party. Disclosure of Material Connection: I received this book free from the publisher through the BookSneeze.com book review bloggers program. I was not required to write a positive review. The opinions I have expressed are my own. I am disclosing this in accordance with the Federal Trade Commission's 16 CFR, Part 255: "Guides Concerning the Use of Endorsements and Testimonials in Advertising." The SCBWI conference on Saturday was excellent! There were editors there from Roaring Press, Scholastic, and Greenwillow Books, an Art Director from Simon & Schuster, and an agent from Writer's House. All the speakers were exceptional, and I came away with lots of ideas for my writing. Even the Art Director did a super job of including writers in his presentation. I met some new writer friends, as well as reconnected with others that I don't often get to see. And, even though I didn't win all the prizes this year, I had a great time! Thanks to everyone who helped on this conference. I really appreciate it. I got another critique of my Ferret story at the SCBWI Conference on Saturday; and, like the others, this editor felt that it needed to be in prose instead of poetry. She, too, liked the idea; but like another editor, didn't know how to market it. So in addition to having trouble getting the rhymes to work, I may be doing all this for nothing. No, I'm not given up on my Ferret story, but I am putting it aside for awhile and thinking about how I can change it back to prose, keep it fun, and make it marketable. In the meantime, I have a new idea I'm working on for a kids book - it's about circles and squares. I'm also working hard developing characters for my 60's era novel. Must keep writing! The Oklahoma Historical Society and the History Matters Foundation are sponsoring a Writer's Workshop on Sunday, May 8, 1:30-5:30 pm, at the Oklahoma History Center, OKC, OK. The workshop entitled, "Lessons from a Best Seller," is structured into three, fifty-minute sessions and a Q&A session at the end. It will be taught by New York Times best-selling author, Steve Berry, author of The Paris Vendetta, The Emperor's Tomb and others. Berry will instruct participants on the craft of writing, including story structure, effective dialogue, point of view, and other important rules of writing. Registration is $85 and ends March 31. Send registrations to the Oklahoma History Center Gift Shop, 800 Nazih Zuhdi Dr., OKC, OK 73105 or call 405.522.5214 and pay with a credit card. Rejections - those necessary evils to make you a better writer! I sent four copies of my ferret story out during the conference in NYC. I've gotten two rejections back so far. At least the second one gives me hope that I can actually write some fiction worth publishing in the future! For those of you who have never received one, I publish mine here for your reference! "Cindy, Thank you so much for meeting me in New York and for the opportunity to read a sample of CAROLINE'S FERRETS. Unfortunately, this is a pass for me. The writing here is good and the premise is interesting but I'm having a hard time imagining how to pitch or sell this in today's market. I'm afraid the sales hook/potential isn't as strong as I need it to be. You've obviously a very skilled writer but I'm not connecting to the material enough to be the best advocate for it in the marketplace, and you deserve nothing less. I'm sure another agent will feel differently and I look forward to reading about your many successes. Cheers," Mary Kole, Associate Agent, Andrea Brown Literary Agency, Inc."
So, what am I doing about it? Well, I'm currently rewriting it, hoping to make it rhyme better and trying to figure out a better sales hook. I'm not giving up on fiction, yet! Jennifer and Mary - Thank you for the feedback! If you live within driving distance of Pittsburg, Kansas, you might want to check out the Called to Write Conference, coming April 1-2. This conference is sponsored by Christian Writer's Fellowship. This year's conference will feature Terry W. Burns, agent with Harline Literary and Jeanette Gardner Littleton, author and editor for Moody Magazine. The March meeting of WIN (Writer's of Inspirational Novels) is going to be a real treat! Come this Saturday, March 5, to hear inspirational author Linda Apple as she gives insights on writing for Chicken Soup for the Soul and using creative nonfiction to write your personal stories. Come at noon with a sack lunch for a time of fellowship.